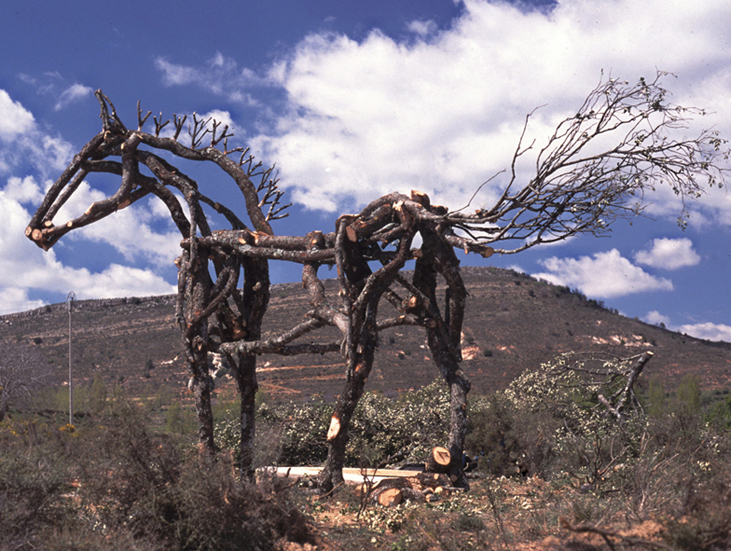 Phil went to Spain in April 2001 to make the 3 metre high horse sculpture, helped by Chris Butler, Director of Castle Fine Arts. It was formed from evergreen oak branches which they gathered from woods on the mountainside above the village of Arroyo Cerezo. This was where they stayed, in accommodation provided by Jose Luis Rodilla, one of the organizers of the Sculpture Biennial. The site was decided on and the sculpture built on the spot, it was named Ciresio by the villagers because Ciresio was the old Roman name of the village.